I know a lot of Australians live closer to a Kmart than they do to an Ikea. So when I recently discovered one of their awesome matching games, I really wanted to share it with you. But more than that, I realised that you could do so much to create a Montessori home with one trip to Kmart! Children's Table and Chair Set White - great for a snack table, art area, work table, almost anything! Remember that you can cut down the legs of almost any wooden furniture to make it fit a younger child/toddler. Activity Gym - for $17 this is hard to beat. It doesn't come with any toys so you can add your own (bell on a ribbon, ring on a ribbon, batting toys, puzzle ball), it looks fantastic. I love the natural timber as it wouldn't distract the child. Simple and affordable. If I were in Australia, expecting a baby I would absolutely check this out! 4 Cube Unit Oak Look - low shelving suitable for storing and displaying children's materials. Floor Basket with Handles - Kmart have so many baskets! Sensory Shapes Assorted - also see these sensory balls for baby/toddler play. Horse Figurine Assorted - Kmart have a large range of model animals, for open-ended play or language work. Large Natural Tray - this could work well for nature collections, model animals, rocks and minerals, almost any collection of materials to display on the child's shelves. Folding Serve Tray - my children love this style for working sitting on the floor doing things like drawing or puzzles, it gives them a flat surface while still sitting on the floor comfortably. + Wooden Rainbow - for stacking, learning colours. Wooden Fruit Book - I love that they have used realistic/photographic images. Bamboo Tray - for storing and displaying puzzles, practical life activities or art activities. I like that this one has handles which may make it easier for the child to carry. Wooden Memory Game - I love this and would absolutely check it out. It's wooden and uses photographic images, I would use it for matching not only as a memory game. Wooden Animal Book - again with lifelike images! Kitchen Utensils Playset Assorted - the description says it's for pretend play only but I would have a good look, I am sure some of these could be used by the child in real cooking too. Wooden Photographic Blocks Animals - have a look at these, photographic images for matching work. Watercolour Paint Set - Kmart has a huge amount of paints and affordable children's arts and crafts materials. 3 Tier Bamboo Shoe Rack - has potential, perhaps low shelving for arts and crafts or for practical life? Origami Paper - for origami, cutting and pasting work, various arts and craft. 50 Piece Wooden Construction Set - I love that this has lots of wooden nuts and bolts for fine motor work. 3 Pack Chubby Brushes - these would be on my shopping list! 5 Pack Textured Brushes - I would be getting these too. My children love the texture wands which are really similar. It's nice to offer children different textures and brushes when painting and exploring with paint. 7 Paint Pot Tray - love this!! I could have included so many more items. Kmart has a large variety of trays, baskets, model animals, blocks, books and arts and, crafts materials. They also have some lovely nature puzzles for older children. Please note this post isn't sponsored or endorsed by Kmart. I also can't guarantee that all of these products are available in all stores. If you've been to Kmart recently, I'd love to hear what you liked or what's worked for your children! Do you use essential oils at home with your children? They are a great way to help calm your child, prepare them for bed, help with their concentration or even with colds. But it can be difficult to know which oils are safe to use. I've asked a lot of different people for help when using essential oils with my children but I've often received mixed messages and some terrible over the counter advice, so I want to share with you what sources I've actually found useful! There really aren't a bunch of essential oils that are 'kid safe', it depends on the child's age and how you use them. Before I use any essential oils around Otto (14 months) I check in my essential oils for children bible The Complete Book of Essential Oils for Mama and Baby: Safe and Natural Remedies for Pregnancy, Birth, and Children. This really is a complete guide with a list of oils that are safe to use at different ages and lots of recipes/blends and suggested uses. If it's not listed here I don't use it! It also includes how to use the oils and dilutions required. This article Safe Essential Oils Use with Babies and Children is by the same author and is a great starter article. The tough thing about using essential oils is that they can be expensive especially if you want to make or experiment with various blends. I also don't want twenty or so oil bottles sitting around that might only be used once or twice a year. Which I why I've always found it easier to buy some blends rather than make them at home. I can't tell you how excited I was to find the Plant Therapy Kidsafe Range (some available on Amazon), a range designed specificially for children. This isn't sponsored and I have no affiliation with Plant Therapy. The Kidsafe range is safe to use with children over the age of two years (always follow instructions). I use these blends in the diffuser and we use the pre-diluted roll-on bottles. So far every blend we've used has been spot on. We currently have the Organic Germ Destroyer and Sniffle Stopper on high rotation. With my older children I always ask for their consent before using essential oils on their bodies or in their spaces. I invite them to make their own blends. Otis (7yrs) has made his own room spray. I also help them, especially Caspar (11yrs), use his essential oil roll-ons independently. I want for him to be in touch with his body, recognise when he needs some help and to appy the roll-on. It can also be very soothing for me to apply the roll-on for him at bed or when he needs help relaxing. If you are interested in using essential oils with children you might also like my previous article DIY Homemade, All Natural Sleep Balm for Children. If you are looking for adult recommendations, I personally love and use Remedies to Roll (in the UK). If you use essential oils with children including babies or toddlers, I'd love to hear your recommendations. Otto in the hug-a-bub Organic Ring Sling c/o Fertile Mind. My first mothers group consisted of ten to twelve mothers who had babies within a month of each other. Besides the timing of our baby's birth, we had very little in common. We met weekly and later fortnightly for over a year. I never really fitted in. I parented differently, I was on the outer of much of the conversation. I recently spoke to a friend who said she didn't fit in with her mothers group either. Her baby often cried through the gatherings, she felt like the other mothers were judging her. Could it be that we all felt on the outer? Could it be putting a group of strangers together with a shared experience doesn't always work? My second mothers group was even worse, I joined an existing group and after not making any personal connections I stopped going after two sessions. After the birth of my third child, I didn't seek out a mothers group. Besides Rebecca, I don't know anyone in person with an infant even close to Otto's age. What I've found most important is to seek out like-minded parents, it doesn't matter the ages of your children. For new parents, this can be difficult. Mothers groups are worth trying but if I had my time over, I wouldn't feel the pressure to stay a part of a group that I didn't really enjoy. A good place to find like-minded parents is at playgroups, there are many playgroups with different themes, some are outdoorsy, some are crafty, some include spiritual and religious teachings and some are bilingual. I live in a city and there are 51 playgroups within a 10km radius of our home, I didn't go through them all but at least two were Montessori and one Steiner based, a few reported to do Reggio inspired activities. I loved our ABA (Australian Breastfeeding Association) playgroup as it had a natural parenting type vibe. Playgroups - often run in community centers. Parent Toddler Classes - often within a school setting. Parent Education Nights on Infant Topics - also within school settings. Parent Workshops - such as the Montessori Childbirth and Early Parenting Preparation Workshop, these can be hard to find locally. Once your baby is a little older, parent-toddler classes are a fantastic way to find like-minded parents and are offered at many Montessori schools. Some schools offer parent education nights on infant topics. At one stage our previous Montessori school had group sessions for new and expectant parents. How good would that be! Another idea is to invite a Montessori speaker to your existing mothers group or playgroup, it may spark an interest or discussion on topics that interest you. Some connections are made more naturally, like finding a like-minded parent at your baby swim class or yoga with babies class! If you feel on the outer or if your mothers group isn't working out for you, you are not alone and there are other options. Search and explore different groups within your community and try online groups if you need the support. Finding like-minded parents where you can make real and meaningful connections isn't always fast or easy but it is always worth the effort. Are you looking an awesome gift for a new or expectant mum? Perhaps for a sister, best friend, daughter or daughter-in-law? I would have bought this for my sister for her first or second baby, or even for myself. The idea is brilliant! The Tuutu Baby Box is inspired by the Finnish Government maternity package, which is gifted to every expectant mother in Finland. The box is filled with the essentials every new parent needs. Running since 1938, Finland has given out more than 3 million boxes in total, and more than 40,000 boxes annually! The focus on quality necessities and providing a safe sleeping space is why it continues to be such a successful program. The box is used as a bed for the baby, it's lid can double as a changing table, and it can later be used as a storage box for toys or become a toddler’s toy itself. The box is packed full of the most useful products for new parents. Nappies - check! Clothes - check! Sheet, wraps, wipes, baby wash - it's all here. Our Tuutu Baby Box, as pictured is c/o Tuutu. The Tuutu Baby Box has everything a new parent is going to need. As I opened it and went through the items I was all "yes, yes, yes!!". It's really an exciting gift to receive. All of the items are practical, most of them are essential and they are all the good brands that I would buy. The clothing, for example, has three different sizes and styles by the Australian organic brand Purebaby. All three of my kids have worn Purebaby, it's really soft for the newborn's skin. Natural Clare Valley Tuutu Baby Massage Oil - yes, this will encourage more infant massage!! Baby Beehinds Magical Multi Fit Cloth Nappy (which doubles as swim nappy) - yes, this will encourage more mums to try cloth nappies!! Cloth bag full of brochures, information sheets and product discounts. As above, the lid can be used as a change table. It's the perfect size! The large wooden ring (for grasping or as a teether) comes in the box too! Can a baby sleep actually sleep in the box? Absolutely. The mattress is firm and it fits the box perfectly. Otto is pictured above at nine weeks, he is possibly on the larger side and he sleeps there perfectly, this sleep was well over three hours. The Baby Box would also be a great idea for Grandparents, so they always have spare clothes, nappies on hand and a safe sleeping place. You could even buy it for yourself so you know you have the essentials covered, especially if you are close to your due date and haven't started shopping. Thank you to Tuutu for our Baby Box, every item has been thoroughly used and appreciated. You can find out more about the Baby Box on the Tuutu website, Facebook or Instagram. What do you think? Is it a good idea? Would you use a Baby Box with your little one? Please let me know if you used a Baby Box or if you are from Finland. I wish there was more information online about Montessori with infants. There just isn't enough information available to support parents through these early parenting days. I would love to write more about this period but find myself struggling with daily parenting tasks. When I read some work by Simone, who is better known for her work with toddlers, I asked her to share some of her knowledge and advice here. This is a lovely article by Simone from The Montessori Notebook about the Montessori view of the Symbiotic Period (the first 6 to 8 weeks after birth). I hope you enjoy and find this useful! when we cocoon ourselves a little from the outside world to focus on developing the important attachments for us to become a family unit. This is not only valuable for the first child in the family, but with the addition of every family member. I first heard about symbiotic relationships in biology class in high school. A quick biology lesson then. The word symbiosis means 'a life together'. A mutually beneficially symbiotic relationship is when two organisms depend on each other and both organisms benefit. For example; coral and algae have a mutually beneficial symbiotic relationship - the coral provides algae with shelter, the algae gives coral reefs their colours and supplies both organisms with nutrients. So how does this apply to bonding with your child at birth? In Montessori, we like to think of the first 6-8 weeks of the baby's life as a period of symbiosis. We welcome the baby into our home, into our lives. We adapt to the baby, and the baby to us. Mutually beneficial. After birth, the baby relies on the parents for food and care. The mother provides the perfect food for the baby and, in return, feeding helps to contract the mother's uterus. Holding the baby also helps the mother replace the feeling of the empty belly where the baby once was carried. The other parent is also seen as an important part of the symbiotic relationship, as protection of, and for the physical care of, the family unit. Bonding. We touch and hold our baby and gaze into their eyes getting to know each other. During (breast)feeding this bonding with the mother develops further. The other parent can also bond with the child through touch, smell, auditory and visual ways - think of daily care activities, as well as singing, playing music and conversation. Trust. The baby learns to trust in the outside world by having their needs met, being held close, and having warm physical contact. In addition, their parent's voices provide a point of reference which they recognize from in utero. Gentle handling when dressing, changing, bathing and caring for the child builds trust in the world and also helps them build a picture of their body schema. Care for the parents during the symbiotic period is very important. This can be more difficult when we live in different cities from family or if we do not live in a close community. Ask friends, families from school, your own parents, or even neighbors to help with preparing meals, offering some help cleaning, or helping to care for older children. I currently live in the Netherlands where each family has a kraamzorg visit their home every day for the first week after a baby is born. They help to support the parents including help with cleaning the house, caring for the baby and older children, and buying groceries. They can also help if needed with advice about breastfeeding and baby care. It is not necessary to do many outings in these first weeks. The baby is still adjusting to the outside world and in the home we can adjust the environment to be sensitive to this - we adjust the temperature to be a little warmer in the first days and the lights a little dimmer. We like to use a topponcino when handling the baby in these first weeks to prevent the baby from being over-stimulated. The topponcino is like a small quilt which can be placed under the baby and will absorb some of the stimulation the baby would otherwise receive when being passed around and which also absorbs the scent of the baby and the parents, becoming a point of reference for the new baby. At the end of the 6-8 weeks of symbiotic life, we often see the child is already very different - they begin to look around during feeding; they are becoming aware of sounds, other family members and 'the outside world'; and they have an increasing awareness of themselves. They will begin to explore from this safe starting place into the wider world. The best possible foundation has been laid. "Developing the right type of attachment during the symbiotic period paves the way for natural detachment and psychological birth happens." - Dr Montanaro, MD, Understanding the Human Being. The wisdom of the symbiotic period allows us to keep things simple for these early weeks. To slow down. To connect. To get to know each other and our rhythms. To live in symbiosis. In a mutually beneficial relationship with baby and parent/s. Thank you to Simone for sharing with us. You can read more from Simone at The Montessori Notebook. An Introduction to Practical Life, with beautiful photographs as usual, at Villa di Maria Montessori School. 7 key phrases Montessori teachers use and why we should use them, too at Motherly. Lemon Curd Muffins: An Illustrated Recipe at Montessori Shop (includes illustrated recipe to download). I know you will love this Kickstarter, The Montessori Toddler by Simone Davies. A peek inside The Nest, a Montessori NIDO at Our Montessori Life. Modern furniture ideas for Montessori Kids Rooms at Twin Pickle. If you feel like Montessori is just too much, this is a good read. Simplifying Montessori: The Value of Concentration at Fishies in a Row. What do you do when your classrooms are flooded? The Biggest Montessori Classroom You've Ever Seen Is Now In Session in the Post Oak School Gym. My two older children are now on school holidays. It's perfect timing to have everyone home. I hope you have a lovely weekend! I've written a little about pregnancy and birth but before our baby arrives it's worthwhile for me to get down my thoughts on parenting a newborn, what do Montessori parents do differently? It's important to note that all Montessori families do things in different ways. I've met parents who have Assistant to Infancy training who use a cot and pacifiers. So my intent is to share what has worked for our family and explain the reasons behind some of these Montessori recommendations. No (or little) swaddling - Personally, I have never understood swaddling. I understand the concept of the startle reflex, but swaddling makes me feel like the child is being physically restrained. We know that newborns can look for their hands and bring them to their face as a point of reference as they did in utero. Swaddling restricts freedom of movement and even in a newborn, we want to encourage movement to increase coordination and strength. No pacifier/dummy - This comes from our need to find the cause of the child's distress or discomfort rather than to use a device to 'pacify' the child - and allowing it to become a habit. It's also thought that pacifying the child through oral comfort isn't the best idea and could lead to comfort eating or soothing through food. We also know that beyond the newborn stage pacifiers are not recommended for language and dental health reasons. No (or little) footed rompers, less clothing - Footed rompers drive me crazy, at least with socks or booties you can take them off when they are not needed. The aim here is to allow the child to experience the world around them, to have a sensory experience even on their feet. Obviously, we don't allow the infant to go cold (especially when sleeping or outside), but where possible we encourage bare feet and even bare legs so the child can move their toes and knees and begin to get some grip and push them into the floor surface/movement mat and begin to move. We want to do as much as we can to limit clothing that restricts movement. No baby swings/bouncers and less time in containers - Car seats are obviously unavoidable however all other baby containers are not recommended or suggested to be used in a limited way. Personally, I also prefer baby wearing to using a pram. Again this is to encourage freedom of movement. Baby swings and similar devices are often used to entertain the infant which is completely unnecessary and some devices are detrimental to the infant's natural development. We encourage lots of time on a movement mat or playmat with some simple materials (toys or mobiles in the newborn stage), this allows for movement and self-discovery. Talk to the infant, as a real person, from birth - I know Montessori isn't the only philosophy that encourages this. It is recommended to talk to the child about what is going on around them, talk to them before you pick them up, change them or wash them, from birth let them know what is going to happen next. Look them in the eye and talk directly to them. This is out of respect for the child and to promote communication. Don't wake a sleeping baby - As a mother of soon-to-be three, I know this is not always possible (hello school runs!). But it's not recommended. At the newborn stage we need to (as much as we can), respect the natural biological rhythm of the infant. This also applies to feeding on demand and not to schedule. I know black-out blinds work for some families, however, I've always preferred to allow some soft light during daytime naps, so the child can adjust their natural rhythm and begin to know day from night. Provide a rich sensory experience - Involve the infant in family life, play music, sing to them, expose them to the family's play, conversation, laughter, and joy. A small rug or blanket (or lambswool) is useful to move around the home so the child can be involved in all spaces, yet nap when needed. A mistake I made with my first born is that children do not need silence to sleep. Take the infant outside, show them the flowers and the trees. I could keep on going but perhaps I'll leave the rest for another day! I hope you have a wonderful weekend! I am incredibly thankful that I am nearing the end of this pregnancy. Not including a couple of weeks in November/December last year, I have been pregnant for over 12 months. This is my fourth pregnancy and it has been harder emotionally and physically. However, I can now see the light at the end of the tunnel and we only have a couple of weeks to go! We are so close! I'm feeling nervous and still a little underprepared (I only ordered our infant car seat on Wednesday!). Today I want to share with you a quick snapshot of our infant/newborn movement area. The main feature of this area is our free standing mirror. We are moving at the end of the year so I was hesitant to put any new holes in the walls to secure the mirror. I am loving that we can move the mirror, our family is so active and the boys are so busy around the house we can move the mirror into other rooms. I was also really concerned about using a shatter proof, acrylic mirror. My main concern was that the reflection wouldn't be clear or accurate, however, the mirror is perfect and I can't even tell that it is acrylic. We have a playmat on the floor. It is quilted and soft. I have another couple of rugs and playmats that we will also use here. A thick rug folded over works well. It's nice to have a couple so one can go in the wash. Keep in mind this area needs a firmish surface, you could use a thin mattress but as the child gets older and begins to move a firmer surface is needed. I have placed our topponcino here, but this will only be used for the first couple of months and it will be used all around the house. You can also see the Whale Mobile, which is the first mobile we will use. I haven't hung a hook for the mobiles yet as I might still move them around a little, I've temporarily taped this mobile to the ceiling, just until I get the positioning right. It's nice to sit back and look over the room for a while before committing to a position. A plant is a necessity and as the infant can't move far they can't get into the plant. It adds a nice touch of greenery and nature. The large green leaves will give the child another item to look up to and observe. This room was previously my office and is right next to the boys' room. It receives lots of afternoon light and I can already see the whale mobile moving gently in the breeze when I leave the window open. If we were staying here longer I would put a baby gate at the door (this is the second story and near stairs). It has always been my aim to make Montessori in the home more accessible, so if you have any questions about this space, please feel free to ask. Today I'm going to challenge traditional thinking about baby change areas, or just prove how offbeat my thinking is. I like having the infant change area on the floor! It's safer for the child and makes the transition for the child to self-dressing that little bit easier. There are two main barriers to having the infant's change area on the floor; it's important to keep some creams, wipes etc out of the reach of the child and many parents have physical restrictions that prevent them from being able to comfortably change a baby on the floor (usually back or knee problems). I also don't like any big or tall furniture in the infant's room. I like having everything at the child's height including low cupboards and shelves. The infant's room (if you have a Montessori nursery or floor bed) needs to be 110% child safe and although dressers and such can be secured to the wall I prefer not to have them there at all. I know some Montessori parents have the change area in the bathroom which removes the need for a change table in the child's room, which if you have the space, can make a lot of sense. As soon as the child begins to walk we begin toilet learning and this when we have moved the change area out of the child's room and near the bathroom. Here are a few infant change areas that I really like! 1. At Kid Level - This is a change area for a 12-month-old, it includes a change pad, a small chair for dressing, a shelf with diapers and a comb and brush, and a laundry bag. It's really simple but so practical. So perfect and all on the child's level. 2. Deliberate Parenting - A Montessori inspired accessible diapering area. This cupboard has doors that close. 3. Otis' change area at How we Montessori. 4. Jean Jean - Montessori floor bed and change area on floor for an infant at five months. 5. Racheous at How we Montessori. 6. The Free Child - This change area is on a dresser but I love the comfortable wool cover and the black and white images on the wall. I've seen a few Montessori change mats (on change tables and dressers) with mobiles that hang above the child. This could work if the child had time to concentrate on the mobile but I wouldn't want to break the child's concentration when it was time to finish and to put the child down from the change table, and for safety reasons you couldn't just leave the child there to finish their work with the mobile. I love the idea of having high contrast images or for an older child visually appealing images for them to focus on but again I wouldn't want to break the child's concentration. Please feel free to leave your thoughts on what change area set up has worked best for you! I apologise for this narrow topic but it's one that I feel is important and useful to me! Today I'm writing about the Montessori Topponcino or security pillow. The Topponcino is typically used from birth to six to eight weeks (or more depending on the size of the infant). It is recommended that the parent/s sleep with or put the Topponcino in their bed so it takes on their homely scent. The Topponcino is then used (from birth) to securely hold and support the infant. From memory, Maria Montessori didn't design the Topponcino (although specific measurements are provided in the Montessori Assistants to Infancy course) but it was a concept she observed mothers using in India. So while I wouldn't say this is only used by Montessori parents it is strongly advocated for in Montessori communities. The Topponcino is a relatively thin oval or elliptical shaped mattress made from wool or cotton. There are lots of organic options. Assistants to Infancy would recommend a plain or soft coloured covers, ruffles or lace is provided at the top. What is key is providing a warm, comfortable, secure and supportive environment for the child. We want the child to build a sense of trust in their environment from the start. We need to provide an environment that supports the child through the symbiotic period. The Topponcino can provide familiarity in touch (texture, warmth), and scent. It can assist with gentle handling and holding and with transitions such as being held by siblings and other family members, it ensures the baby is physically supported and this is especially useful when being held by or passed to young or older members of the family or those not familiar with holding an infant. It can assist with transitions such as being held and then being placed on their floor bed or movement mat. Is is important to use the Topponcino regularly, daily so the child feels that sense of familiarity which can provide comfort and security. As Toppocinos are handmade they can be difficult to source. Here are few companies that have been recommended by readers and other Montessori parents. Topponcino n More (US), I've stocked this brand in my store and would recommend them, they have the largest range. Baby Burrows (US), the one we have is here (it's 100% organic with good international shipping). 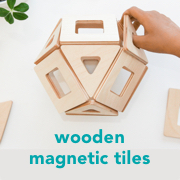 If you want to try a DIY, Voila Montessori has a detailed tutorial here. Many Topponcinos are made to order so if you are planning on using one, order well before your baby is due. Also, the Topponcino is a lovely, thoughtful gift, even for parents new to Montessori! Top Ten Materials for Montessori Newborn Shelves! I'm at the stage in my pregnancy where I can't get a good night's sleep. Remember what it is like? Not able to get comfortable no matter which way you lie? I'm also at the stage where I wished the nursery was finished. Well, it's getting there. I've put up some pictures and a fabulous friend passed onto us the most gorgeous wooden bed. We still have our low shelves from when Otis was little (a friend borrowed them but we now have them back!). So I have started to tinker and move things around a little. It has me thinking, what do you put on shelves for a newborn? Why even have shelves for a newborn? We prepare shelves for the newborn as they provide a point of reference for the child. As the child's eyesight develops they begin to make sense of their room, they begin to make a mental map, their shelves are a significant part of this. It is where their toys and materials are stored and it keeps the space organised from the start! Once the child begins to move, commando crawl, often their first significant movements are from their (floor) bed towards their shelves to play! I have found it best to prepare the shelves before the child is born and to keep it as simple as possible. I also try to think of ways to make the shelves look beautiful and bits of colour on the natural timber really help with this. I try to put out materials the child is likely to use in the first three to six months, think grasping materials. With Otis I put out simple puzzles, stacking toys, palmer and pincer blocks but these won't be used until the child is sitting. I've done a quick survey and put together the top ten materials I have seen on Montessori newborn shelves! Board Books - including those with high contrast images (black and white) and those featuring baby, baby faces. Ball basket - small basket featuring various size and textured balls. Baskets are useful as you can take them to the play area or movement mat, or into another room and just give one or two items out of the basket to the child. As much as possible it's also a good idea to have low baskets so the child can see and become familiar with what is in the basket from a distance. So what do we actually have on our newborn/infant shelves (pictured above)? Textured Shapes (similar to these). Our Bells on a Ribbon, Bell Rattle, and Interlocking Discs are c/o Montessori Shop. There are of course many materials not listed here that are perfectly suited to the infant environment. We can get caught up in sourcing specific products, these are listed as examples and to provide ideas only, not as an exclusive list! Black and White Mobiles for Montessori Babies - including alternatives to the Munari! Have you ever tried to make or use the traditional Montessori Munari Mobile? It is the first in the visual mobile series offered to a newborn at around 2-3 weeks of age. They are incredibly hard to balance and our glass globe broke while Otis was underneath it. We replaced the globe but I never again felt really safe around it. With our next baby, we are going to skip the Munari! We are fortunate that we have access to a lot of resources and already have a few black and white mobiles to try, so I thought it would be nice to share these with you. I want to say there are other options, you can skip the Munari and still provide the very young infant with the same opportunities the Munari provides - black and white contrasting images for the infant to focus and track, develop their visual sense. Remember we can also provide lots of contrasting images in books, pictures, and fabrics. As with all Montessori mobiles, I try to stick by the rule of no more than five elements (five birds etc), the whale mobile is my only exception (because I love it so much). This is as not to overstimulate the infant. If you are going to DIY or use an alternative mobile keep this number in mind. Most of these mobiles have abstract elements (shapes, images etc) however if you are going to use a mobile that depicts real animals or objects make them something that can make a realistic motion (floating, flying) which is why we typically use animals that swim (water animals, fish, whales) or that fly (butterflies, birds, dragonflies). 1. Munari Mobile (this one is from Bunny + Bella, UK). Etsy is a great place to find Munari Mobiles, I would look for one fully assembled (worldwide). If you are going to make or assemble a Munari yourself make it well before your baby is due. 2. Black and White Baby Mobile (Australia). 3. Mother and Baby Whale Mobile (US). 5. Flensted Swallow Mobile (US). 6. Montessori Black and White Mobile (US). We have mobiles number 2, 3 and 4 so we will have to see which one our baby responds to best, we might not have time to use them all. The whale and bird mobiles look lovely in any children's space, bedroom or even in a nature area, so have some longevity. If you are new to using Montessori mobiles or mobiles in general with an infant, keep in mind to put the mobiles in a movement or play area, not above their bed, to keep the visual mobiles out of the child's reach, mobiles should be placed slightly in front of the child (not directly above) and the Munari should be around an arms length above the child. Some movement is recommended, so a gentle breeze (open window) can work well. 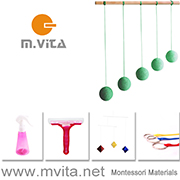 If you are new to using Montessori mobiles please feel free to ask any questions! I've become obsessed with wool, especially now we know we are moving to a cooler climate. My direction for buying baby clothes has changed completely! When we lived in Canberra the boys wore a lot of wool including organic merino thermals (we loved these). Now I'm starting to stock up again. We know wool as a natural, breathable fibre that helps to regulate body temperature but most importantly is also so, so soft on an infant's skin. One of the best recommendations I've received is to use Disana Wool Covers (Australia here). I was shocked when I opened the packet. Not only are they super soft but stretchy and gentle. Honestly, I feel they are the ultimate in comfort and I can't wait to try them on our little one. The Disana wool covers are fine organic merino but are made in Germany. We also have the Baby BeeHinds wool covers which are made from Australian wool. Another fantastic idea I've received, again especially applicable to a cool climate, is to use Disana wool leggings as a cover. If you are considering cloth nappies/diapers and/or wool covers I encourage you to give it ago, once you have a system in place it can be a really simple process. It can also be incredibly rewarding. But I am on my third child and I know cloth nappies can feel intimidating early on. Onto lanolising. It only takes a couple of minutes. We'll also be lanolising our wool puddle pad and change mat. This time I've used the Disana Lanolin Conditioner. I put 1 tablespoon of the conditioner in 1 litre of lukewarm water and rinsed the cover, gently squeezed out the excess water and left to air dry on a towel. I know some of these will need to be lanolised more than once, but it's so quick and easy to do. They might also felt with wear. Is it strange to say I also really love the smell of wool, it's all so natural and earthy! I've also started to play around with some DIY baby change spray. I love the idea of using aloe vera. I am sure that water alone will work well but I want a backup spray for some of the messier changes, and I want it on hand before the baby arrives. There is so much to do once the baby is here it's best for me to be as organised as possible. I didn't add any essentials oils to this one (generally not recommended for babies under three months) but will need a tinted bottle once I do (so the essential oils don't break down, although small batches will be used up fast). I've received a few suggestions but if you have a tried and true recipe for baby change (bottom) spray please let me know. We have so much going on at home, I'm really trying to reduce the stress by focusing on the little things that I do have control over and that I can do now to prepare for later. Thank you also for your kinds words and support as always!